Dorothy Wiley is the founder of #AllendaleStrong—a neighborhood group that has organized in opposition to Shreveport's proposed I-49 highway connector, which would directly run through the Allendale community. Wiley has lived in the neighborhood for many years and is passionate about seeing it grow and thrive. I talked with her in early February to hear about the formation of her group, their work to stop this highway project and why she loves her neighborhood. Rachel: What is your background in Shreveport and this neighborhood? Were you born in Shreveport? Dorothy Wiley: I was born on St. Louis, MO and we relocated here when my father passed. I grew up and went to school here. We moved to New Orleans in 1978. Hurricane Katrina pushed me and my family back up here and that’s how I got here in Allendale. When I came here, land had been donated to this neighborhood to be homes for the evacuees, and we were fortunate enough to be able to purchase one of these homes. Rachel: What was Allendale like for you growing up? Dorothy: Allendale was a thriving community. We had insurance companies, funeral homes, gas stations, restaurants, stores, clubs, shoe shine places, hair parlors, bible stores... People used to come to Allendale to do and get whatever they wanted. When Allendale was thriving, downtown was thriving. When they put that freeway I-20 through here, it knocked everything out. It divided people, it moved people, it moved businesses out of the way. I felt like that was a part of the beginning of the destruction. Rachel: Tell me about the #AllendaleStrong group. How did that get started? Dorothy: The organization was formed as a learning community in February of 2012 in response to the confusing and manipulative process of NLCOG [the Northwest Louisiana Council of Governments, who is overseeing the I-49 project]. What they did was promote an inner city I-49 expressway to run into our neighborhood and across our wetlands. So the Allendale neighborhood organization got together as a group of people. I started the organization. I’m retired and I’m a community activist. 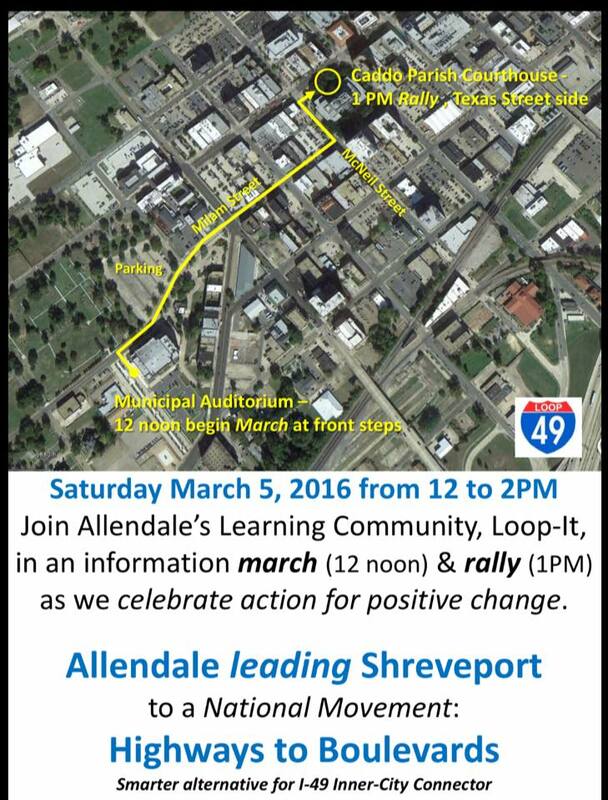 Originally [the group] was called "Loop-It I-49" and now it's "Allendale Strong." In this learning community, we learned that inner city expressways have failed. We’ve taken that information and we’ve used it and passed it out and did bibliographies and we have a Facebook group. The people [promoting the highway] have a one-track mind. I don’t care how much information, how many facts you present—their hearts are hardened because they want what they want. This is the city we live in. We give the information about what’s happening [as a result of inner city highways], not just in other American cities, but around the world. I’ve stood in front of the mayor and the council and given them all this information, but they don’t want it. Flyer from a community meeting. Click to view larger. Rachel: What’s been the #AllendaleStrong group’s process for fighting the highway so far? We had also written complaint letters to Anthony Foxx [former US Secretary of Transportation]. This is what happened: During the first public process, one of the NLCOG team members laid her hands on one of the members of our community and escorted him out. That was one of the complaint letters we sent to Anthony Foxx. After we sent all these complain letters to Secretary Foxx, he said, somebody needs to get down to Shreveport and see what’s going on. The administrator of the Federal Highway Administration (FHWA) in Louisiana sent some representatives to meet with NLCOG and our group to hear our complaints. Our complaint was: We don’t want a cut-through running through our neighborhoods. It divides a community, displaces people, causes congestion, [...] and has major costs associated with it. The issue is 3.5 miles between I-49 and I-220. We want a local business boulevard instead of a highway. We have a street here called North Market/US 71. We want to make that into a complete street as a connector and then use the existing loop [for the highway]. […Eventually, NLCOG] came up with this 5th "Build Alternative," but it was the loop. They’ve been driving on this for 40 years! They called it the “No Action” alternative. That confused people. Rachel: So where are you at in the process now? So they started destroying the park. [The city] took the playground equipment away. My neighbor decided to start cutting the grass at the park. It hadn’t been cut in one year. […] We started hanging out in the park, having meetings there. The last thing left was the pavilion. A guy came to take down the pavilion. We were sitting on it and refused to leave. Over the last 11 years, we’ve partnered with Community Renewal International and the Fuller Center for Housing. We have transformed 30 blocks of this neighborhood from the most dangerous to the safest. When we came here there were drugs homes, a store selling drugs on the corner… This neighborhood had high crime. It has now dropped 82%. [...] We have a corner store, a community garden, and emerging leadership. Allendale is thriving. It’s beautiful. We have two Friendship Houses in the community where kids eat and do their homework. Rachel: And what impact would the highway have on that? Dorothy: I see this as an ice chisel and they just keep chiseling away at [our neighborhood] until it’s nothing. Our hope is in learning together that we can grow our collective creative capacity so that we can change our community. They thought this wasn’t going anywhere. They thought we were just some little people over here. But this thing is bigger than Shreveport. We just focused on finding a better alternative. When we had our last public meeting, they said that this is going to cost between $600-900 million. Even when we met with the FHWA they said, “Shreveport is broke.” Taxpayers will have to pay 10-20% of the cost of the highway. We have no money. They don’t even take care of the stuff we have. I told them, “You need to fix some of these raggedy streets.” [...] They want to build a freeway, but won’t even put in enough asphalt to fill in a pothole. Rachel: So we've been talking about a project that's going to cost hundreds of millions of dollars that will leave your neighborhood worse off. What would you do if you had even just $10,000 or $100,000 to use to make your neighborhood better? We could start fixing up one of these buildings and make a coffee shop out of it. Let us do some planting over in the park or along the boulevard to enhance the beauty of [our neighborhood]. Small things like that. We've got to start somewhere. We have a nice little store in our community. It was open, but it’s temporarily closed. We want to keep something in our community that belongs to us. Rachel: What do you love about your neighborhood? The other thing I like about my community is the people. We come together. Other people from other communities have started coming over here and they like it. They can’t believe the way Allendale is. I love my community. I love what it has become and what it’s still becoming. We need to come together and change one community at a time, which will change the whole city. Thank you to Dorothy Wiley for her work to save this neighborhood and her willingness to speak out.